I’ve had so much fun with this new deck the last couple of days. I’m used to playing higher elixir decks, but this one is filled with low elixir troops so you can cycle through it really fast. That means you have the Hog Rider available very frequently and you can keep attacking and attacking almost non-stop. I found this deck in one of GamingWithMolt’s videos, you can find his channel here. In many games that I have won with this deck I’ve been attacking pretty much the whole game, and all my opponent has been doing is defending. That makes for some really fun and exciting games, well at least for me, I’m not sure if it’s that fun for my opponent defending all the time. Here we have 6 common cards that I’m sure most players at arena 5 an above already have access to. There is only one rare card and one epic. The epic card, lighting, can easily be switched out with rockets. 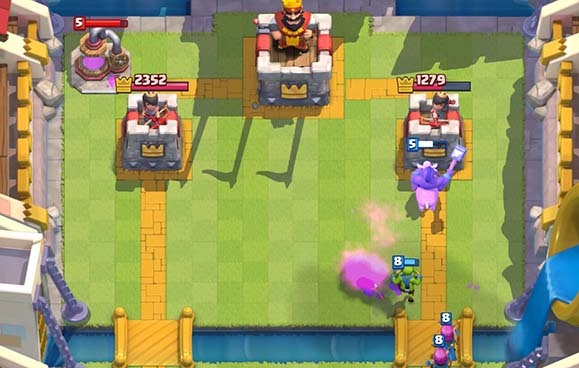 The Hog Rider is very important however, but Prince might work in his place. It’s a really fast deck to cycle with average elixir at 3.1! The Hog Rider is very important. He usually leads the pushes you will make with the Archers and Goblins follow him as backup. This card is really important to counter two very popular decks. The first deck it counters well is the spawner decks, well placed Lighting spells can really stop these decks. 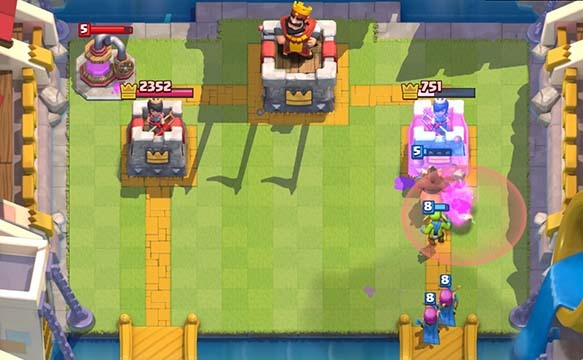 The second type of decks you stop with Lighting are the very annoying X-Bow decks, especially if they surround their X-Bow with cannons and teslas, Lighting does so much damage to them. These guys are in most of my decks, I actually ranked these #3 for all time best cards of Clash Royale. They are cheap and decent at taking out enemy flying units. You also use these together with the regular Goblins to distract incoming troops until you can deal with them. I’ve started to get more and more fond of the Goblins. 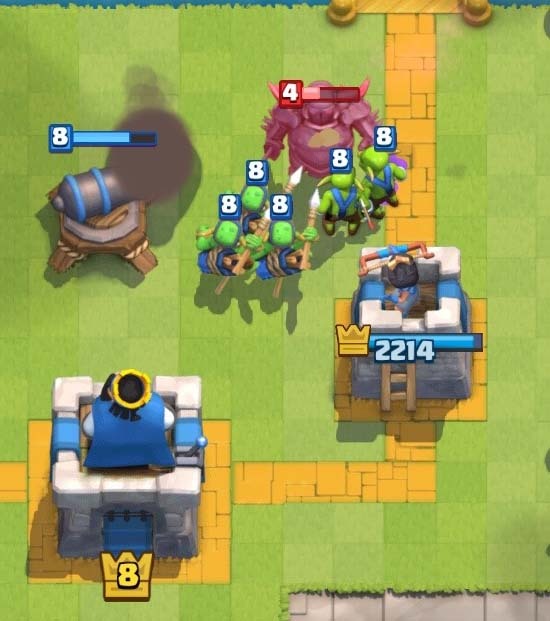 Goblins do a ton of damage if you get them to your opponent’s tower. With this deck that will often happen as they will run behind the Hog Rider. The Goblins are also important for taking out Pekka and Golem. At arena 6 and 7 you will often face players with high level Pekkas or Golems, the Cannon works really well in distracting and taking these troops out. 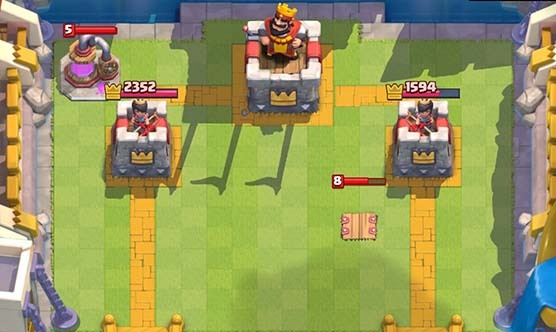 Also, you will face lots of X-Bow players, the most annoying opponent out there. 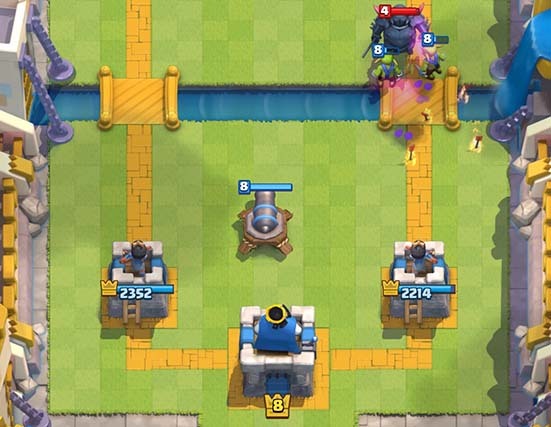 The Cannon is great at tanking damage from the X-Bow while your other troops take it out. Arrows is a great spell for dealing with swarms and giving you elixir advantage. Fireball could also work here, but I prefer the lower elixir cost of Arrows. The Zap stun is really nice when you have all your small troops hitting the enemy tower. Just one more round of damage from them means a lot, and the stun from Zap will often give you that. Zap also takes out small troops like Goblins and Skeletons. With the new update Archers will be even stronger, as they now will attack just as quickly as Spear Goblins. I really like having this as an opener in this deck as they walk slow so you can regain elixir to drop other troops to join them when they get near the bridge. There are some cards here you can replace, but to get the most out of the deck the only card you should play around with is Goblin versus Skeletons. 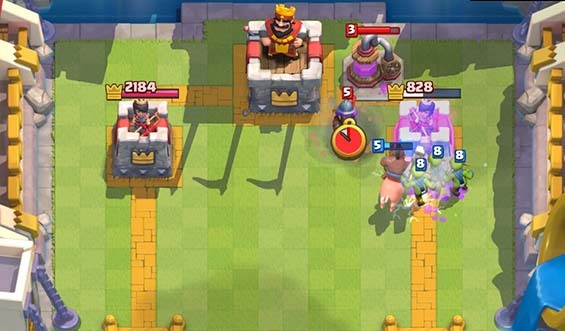 Hog Rider should not be replaced, only card that might work would be the Prince. Archers or any of the Goblins could be replaced by Minions. Lighting can be replaced by Rockets. Arrows can be replaced by Fireball. Zap and Cannon should not be replaced. With this deck I love the Archer opening. The reason is that it gives you time to see what your opponent is doing while they are slowly walking towards the bridge. 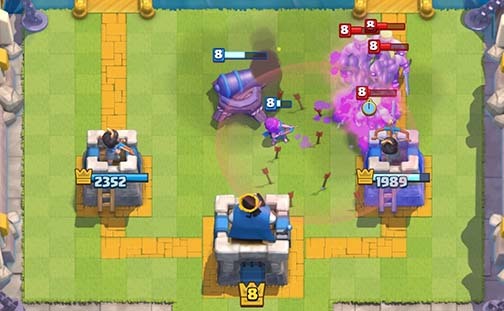 If your opponent places an Elixir Collector the Archers will join in an all in opening push. Spear Goblin opening also works, but they run really fast so you have to make a very quick decision if you want to open with a big push or not. In most cases when I open with these I just let them cross the map solo and do some damage to the enemy tower while I make the push later. The cannon is a very conservative opening, but if you don’t have the cards you need for a push in your hand it’s fine to open with this. 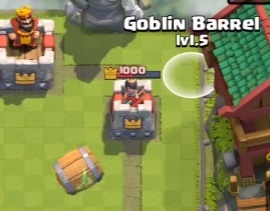 The card you would want to make an opening push is the Hog Rider, one of the Goblins and Zap. 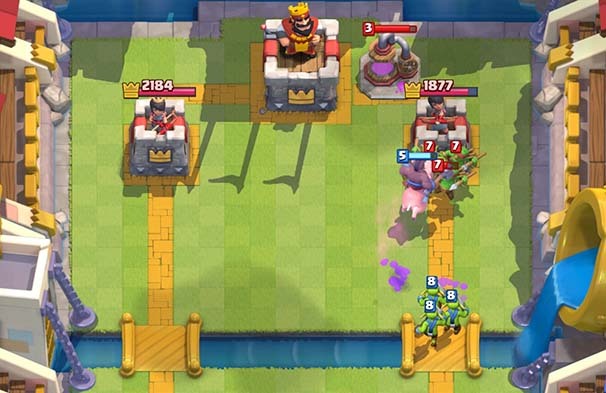 The main goal of this deck is to rush for one of your opponent’s towers and take it down, and then defend your towers to take down the victory. Often you will take out two towers and win 2-1 with this deck as well. Here I’ll show how to go about taking down your opponents towers with this deck. If your opponent opens with an elixir collector it’s the perfect time to go for an early push. Especially if you already have Archers walking across the map towards him. 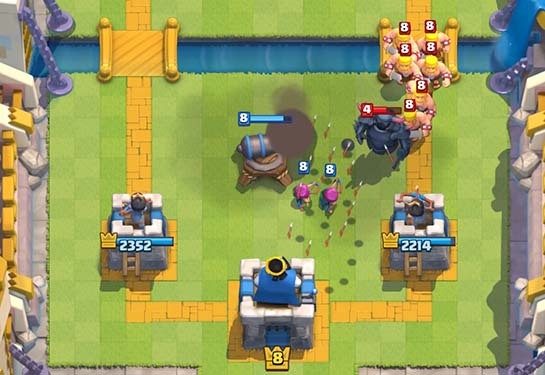 Back up the Archers and lets go, even if you don’t have the Hog Rider you can cycle through to it fast. Here my Archers and Spear Goblins are at the tower. They will do a ton of damage by themselves if my opponent doesn’t react. Here he has killed them with Arrows and placed spear Goblins down as well. I’ve played my Hog Rider with Goblins running behind him. I also have Zap ready to cast, either to kill troops like Goblins or stun other troops. Here Zap has taken out the enemy Spear Goblins, any my Goblins have reached the tower. My Hog Rider has been doing a ton of damage meanwhile and the push is going real well. About half a minute into the game my opponent’s first tower is down, with my own towers being at full health. I have had lots and lots of games starting like this. The Tesla is so annoying, and often your opponents have other defensive buildings as well. 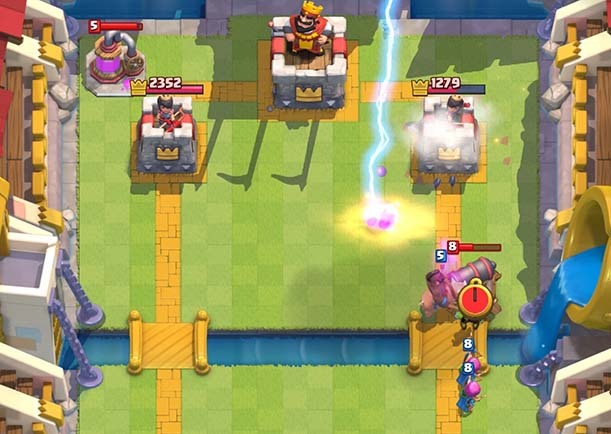 In that case Lightning works really well at taking out these defences so that you Hog Rider can reach the tower successfully. As always, we will start the push as soon as our opponent puts down the Elixir Collector, or any other building or troop that costs a lot of elixir. Here is the start of the push, the Hog Rider with Goblins and Archers supporting from the back. I have both Zap and Lighting ready to cast, depending on how my opponent reacts. Here he placed down another defensive building, the Cannon, so I cast lighting to take out both that and the Tesla that was shooting at my Hog Rider. Now I’m holding Zap ready to cast it as soon as my opponent places down defensive troops. My Zap took out some Spear Goblins here and lets my Hog Rider get another few hits off at the enemy tower. My Archers are still unharmed and shooting from the back. Archers actually do a lot of damage. The Archers finishes up the enemy tower and they are both still alive as my opponent places down a Tesla way too late. 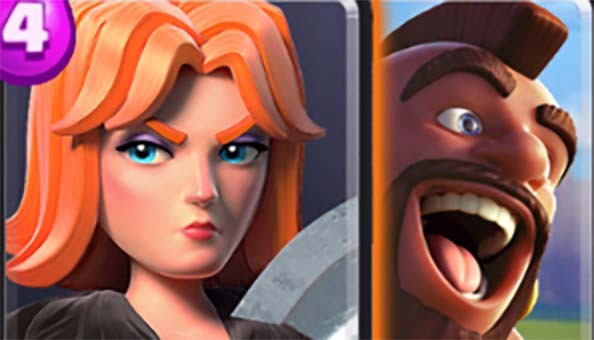 Once you have taken down one enemy tower you can play a little more defensively and only push at the good opportunities. Here are some examples of defending. Use the Lighting spell against the annoying X-Bow players. Especially when they do the Cannon, X-Bow and Tesla combo the Lightning spell works really well. You also use Lightning vs spawner decks. Even better if you can hit the Elixir Collectors at the same time. 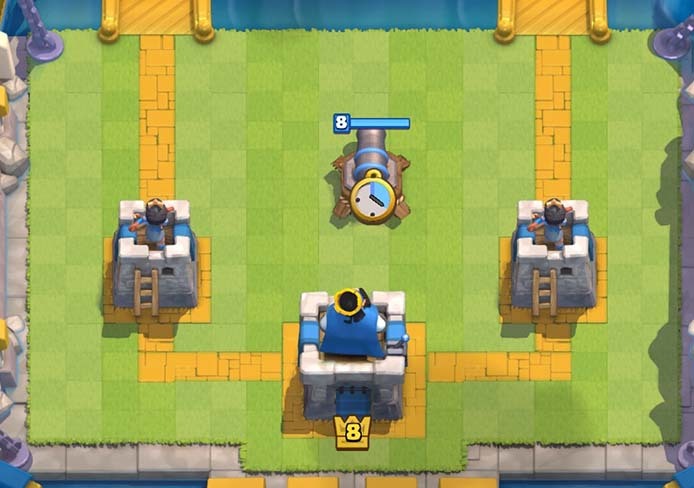 When a Pekka is arriving you want your cannon up in the middle of the area in front of your King Tower. As he is approaching you place troops to distract the Pekka and get him to move in the direction you want. Don’t place all your small troops at the same time, expect that your opponent have Arrows ready. A bunch of Goblins can easily take out a Pekka together with a Cannon and your tower. Here is another example with a Pekka, this time backed up with a bunch of Barbarians. Use some troops to get the Pekka where you want him. Arrows combined with Zap can handle the Barbarians pretty well. Here the Pekka is down and I Zap the Barbarians and leave my tower and cannon to deal with what is left of them. A good way to deal with both Barbarians and stronger troops is to distract them back and forth by placing your cheap troops in good spots. Always be ready for the comeback. Even if you lose one of your crown towers early in the game, keep playing, this deck can turn the match around really fast. 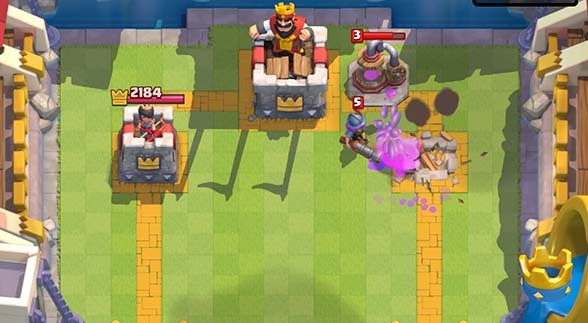 Wait until you are at 10 elixir to drop the Cannon, if you drop it too early you are wasting the lifetime of the building. Use Goblins and Spear Goblins to distract incoming troops while your Cannon and Tower take them out. 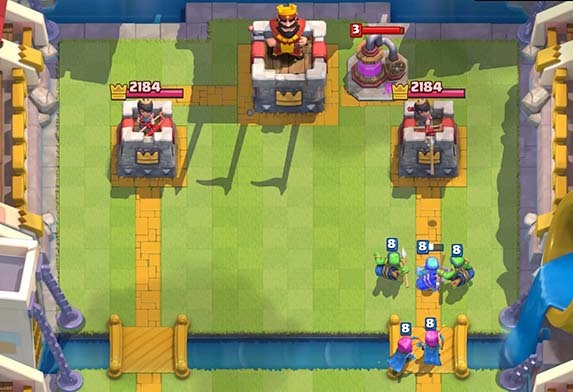 Figure out what troops your opponent has and save the Arrows for where it does the most damage. Pay attention to what your opponent has dropped and how much elixir he has left. When he is low it’s time to push. 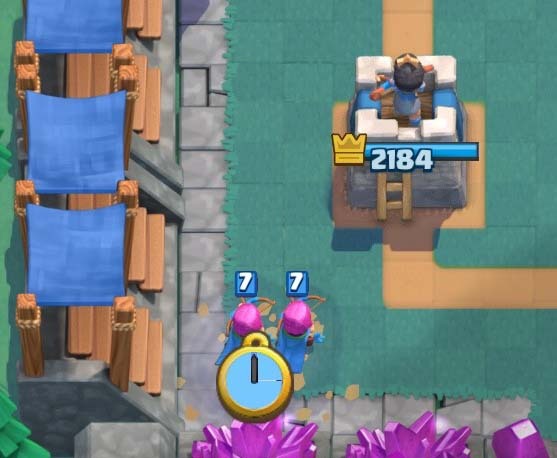 Don’t wake up the King too early if it looks like you have to take out both towers to win. 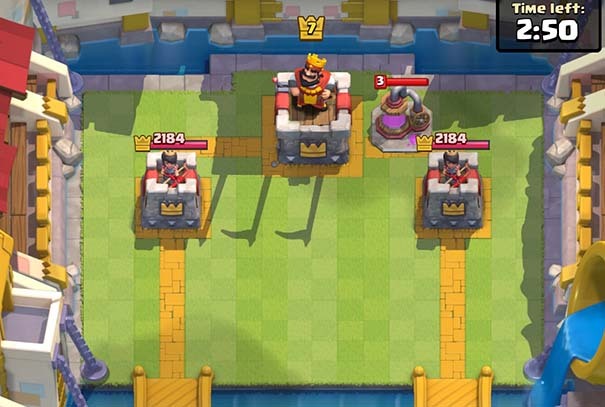 Once you take out one tower, the king wakes up and you have to deal with him when taking out the next one. It’s often better to leave the first at low health and then take out both towers around the same time later in game. This is a video where this deck is being used by Molt from the GamingWithMOLT channel. This deck is awesome and so much fun to play. It makes for really exciting games with lots of action as you will always have cards to play. It’s also a very aggressive decks where you can keep your opponent on the defensive. Please let me know what you guys think about the deck, as it looks now this will be my #1 deck pushing up towards Legendary Arena. How can you defend with this deck against an air deck consisting of atleast two of baby dragon, ballon and minion horde. By the time one of them is killed by the troops the other would have either destroyed the tower or brought it too very low health. what can i replace lightning spell with? What can I replacr lightning spell with? Hey Oyvind, I like this deck a lot, ty – a lot of fun to play with. But i have low level troops and before i decide to level them up I just wanna know from you if you think the deck still if good even today? What do u think? 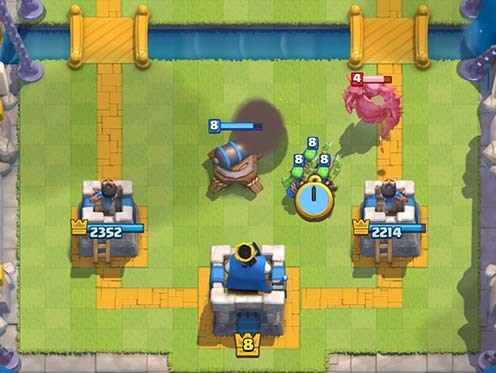 How are you supposed to deal with baby dragon and bomb tower? Uhh… I used it once. 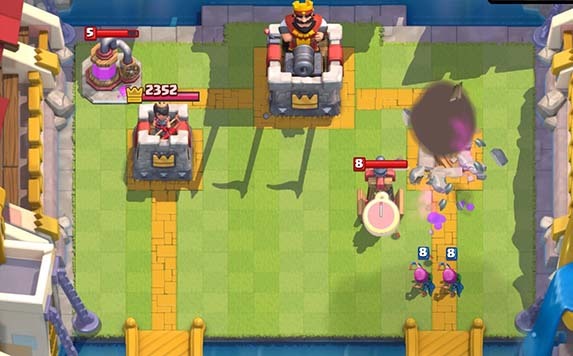 I find Hog Rider easy to counter too.. if you are sending that against a Bomb Tower, then just Goblins would be enough to deal with it, and the tower would only lose 50% of its HP. I guess Baby Dragon isn’t that hard to deal with.. I take it back. I am in Arena 4, but I really like the style of this deck. Is there something I can use to replace Zap? 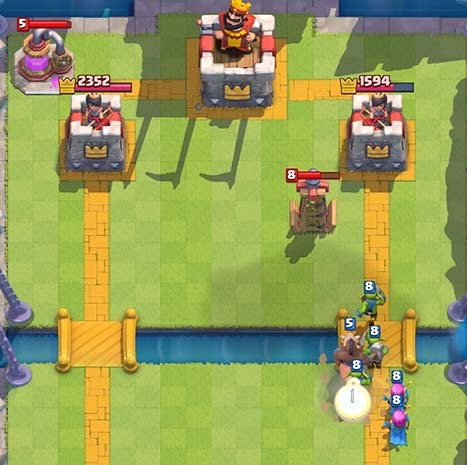 Its viable to use Lightning if the opponent is using both Bomb Tower and Dragon, but they are both AOE so he won’t do that. 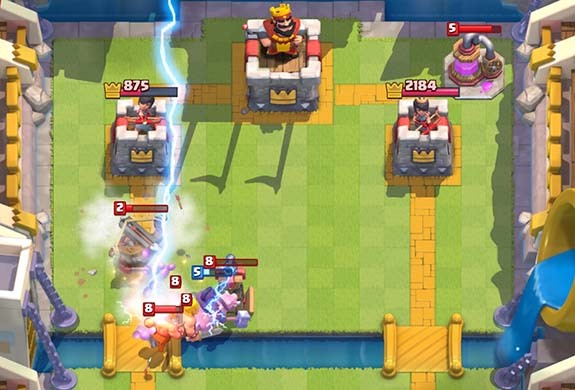 And using an elixir 6 Lightning to take out an elixir 5 Bomb Tower seems wasteful. Mostly its placed in the middle of the Arena Towers away from them, so you can’t nuke them both either. Yep. Which deck are you using right now? Arena lv? Strategy? Pros & Cons? Thanks. I switched tesla for freeze btw. 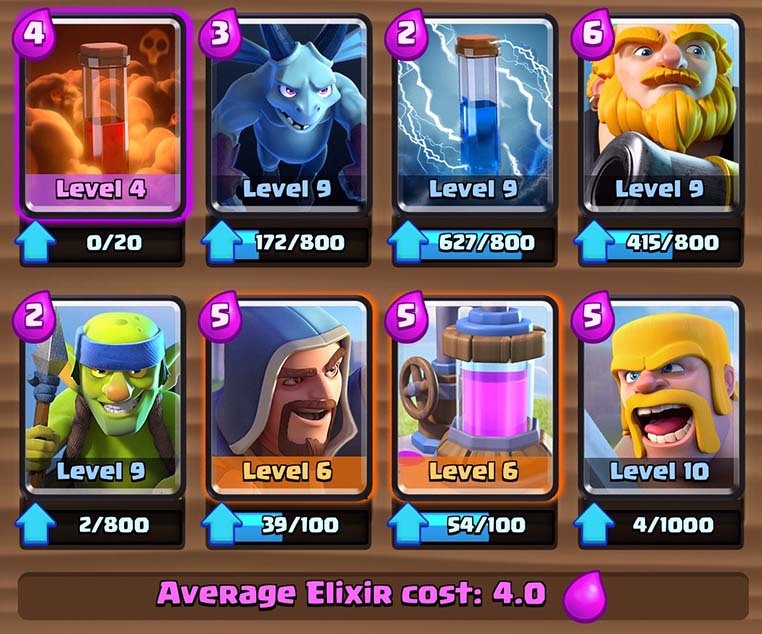 Ok as for your pros and cons, the cheapest card here is the archers, but if you use the cards right, you can get a lot out of your elexir. This deck works great against spawner/swarm decks cause of the bomb tower. Use it for killing barbs, skelle armies and as a distracor for hogs/giants. I find myself struggling in arena 5, skele giant+wizard is a bad combo for this. Usually i push with dragon/archers, and if it goes well, then prince too. The absence of arrows isn’t too great, but if u want you can switch the freeze for it. Any updates on this deck dude? 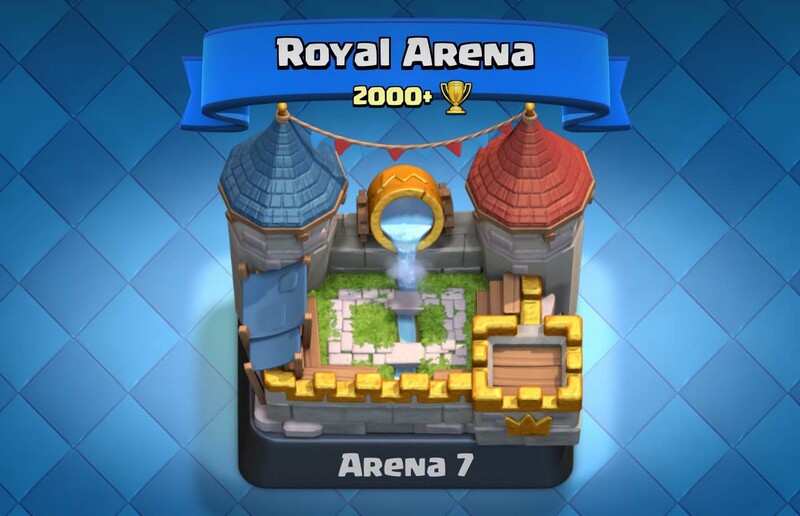 Ive been using this since 1.7k and now I’m in royal arena 7 at 2.1k trophies. Are you still using this deck to push at arena 8? I still use a very similar deck yes, but I use Poison, Valkyrie and Skeletons, instead of Lighting, Goblins and Arrows. That makes for an even lower elixir deck that is a lot of fun to play. I’m not sure about the Valkyrie yet though, I’m also experimenting with Giant, Knight and Tombstone in that spot. Ohh i see what about your hog freeze deck i can’t try it yet since i don’t have freeze at this point. Is it effective or this low elixir rush deck is more good to use? This deck really work! Ive been using this deck for 4 days and my standing as always when getting my crown chest range to 7-8 wins 2-3 loses 0-1 draw thanks dude! Awesome guide btw I replaced tesla for cannon and so far has been an up and down game because if I use cannon it always ends up being destroyed by flying units and my spells are always being used on them while they attack my towers with barbs, prince or giant…so I used tesla so that it could have at least air defense. It’s a matter of preference, tesla can be replace by cannon in most decks. Great guide again my brother! I tried it and it works pretty well! Always in attack mode can i ask what are the counter decks for this type of deck? Royal Giant and Sparky would be hard to stop with this deck. Yep, freeze is a great addition to the deck. Thanks…And will lvl 1 lightning be enough for the deck?